Three former Villanova All-Americans competed in the 1500 meters tonight at the Lignano International meet in Italy. All three set new PRs in the process of finishing 3-4-5 in the race. Marina Muncan, who had her Serbian National Record bettered over the weekend by Amela Terzic (4:07.59) at the World Junior Championships, reclaimed that record by finishing 3rd, in 4:06.48. Next across the line was Nicole Schappert, who continued her 2012 habit of impressive performances and set yet another PR in coming 4th in 4:06.87. 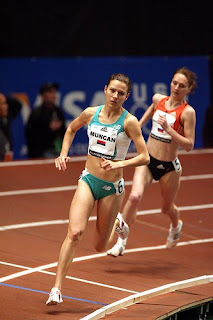 The time improved upon her previous PR of 4:07.79 set on May 18th of this year. In 5th was Sheila Reid, who also set a new 1500 PR of 4:07.07, seven-tenths of a second better than the 4:07.77 she ran earlier this month. Reid remarked afterward: "Not bad for 5K training." All in all, excellent work. Next up on the schedule for Reid and Schappert is another 1500 competition in Ninove, Belgium on Saturday.